Well pumps do not run continuously. Instead they transport water or other materials to a storage tank where air compression takes place. The air pressure in the tank then moves the water to it’s destination. When the air pressure reaches a pre-determined level in the tank, the well pump activates again, replenishing the tank. 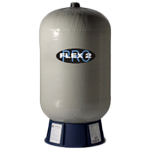 Flexcon tanks are manufactured with cold rolled steel and finished with primer and high gloss quality paint. Clean air tight welds are achieved using the most modern welding equipment available. A trim strip on the bottom of the skirt helps prevent damage during installation. Each tank undergoes a rigid quality inspection process that includes high pressure testing, seam weld tests and our famous helium test. The final air charge check before packaging ensures that every tank arrives on the job site with the specified aircharge.